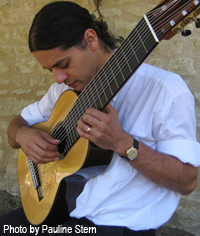 André Stern is a French musician who grew up without schooling. This interview was conducted by telephone in French in July, 2012. The interviewer was in Quebec City, Canada and Stern was in Avignon, France. 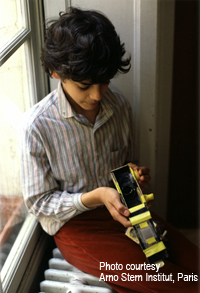 Stern has written about his unschooled life in two books, available in German, published by Editions Zabert Sandmann (Und ich war nie in der Schule, 2009, and Mein Vater, mein Freund, 2011). The first one has been translated into French under the title Et je ne suis jamais allé à l’école, published by Actes Sud, 2011. He and his family are featured in this news report. 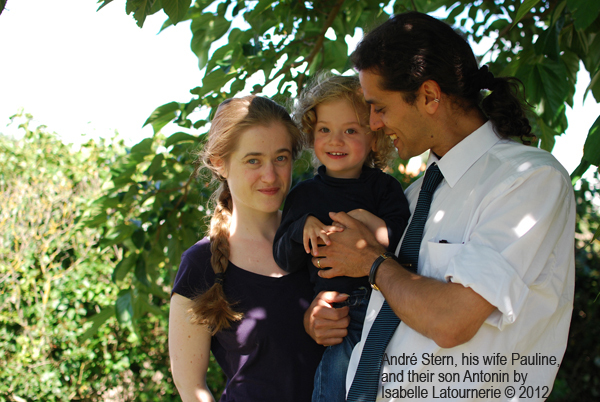 Q: André Stern, you’ve never been to school, you hold several jobs, you are married, and the father of a little boy; how’s it going for you today? A: Very well! My childhood, my last forty-one years of childhood and their events are doing very well. I am happy. Of course, this includes the challenges, crises, obstacles, everything that is related to a normal life; I’m not someone who does not know reality. But I am happy. I dare to say it: I’m a happy child. Q: You are on tour in Avignon. Are you with your family? A: Voilà! We are in Avignon, the three of us together. We have been coming here since 1999. Our little family of three, the extended family of six, and the great theater family now have a new member called Antonin. Q: How old is Antonin? A: Antonin was born in December 2009. Q: Do your occupations always allow you to travel with your family? A: Not always with family. There are sometimes many kilometers to cover. We travel a lot, mainly in Europe but also in India, in Africa. We always try to travel as a family, although this is not always possible. For example, recently I had to take four planes and four TGVs [high- speed trains] in four days, which is not something you want a two-year-old child to go through. As for the trades that I practice, I add a nuance. I find it hard to differentiate trades and hobbies, jobs, livelihoods, and dreams; life and learning; family and professional life. It’s all very separate in some people but, to me, that is not the case at all. I practice these occupations that make me very happy; I did not have to restrict myself to a single profession, a single direction. Many occupations have emerged along the way. There are all those occupations that I’ve always wanted to perform, and some others I do not refer to as professions. Currently, here in Avignon, I am a guitarist, a composer, and a performer. I am the co-director, with Giancarlo Ciarapica, of a theater company. We are here in Avignon for the theater and music festival. Currently, my occupations are, in order: guitarist, luthier [stringed instrument maker], author, and journalist. I am also director of the collective “Des hommes pour demain” [“Men for tomorrow”], initiated by Prof. Dr. Gerald Hüther, advanced neurobiology researcher. Beyond that, I also work with computers, machines, and devices. And I am a close colleague of my father, along with my sister. But right now, my main occupation is being a father: observing, taking notes, sharing the childhood of my child. Q: Your parents offered you the choice – it is indeed a choice – not to go to school. Your book describes a continuity of your parents’ lives in the life of this young couple welcoming a child. How have you experienced that? A: I don’t know if it was a choice for me; it was their choice. It is wonderful that parents make choices – this was what drove me to write my book. For most parents, in France, there is no choice: everyone starts with the principle that children must attend school. (And here I must specify that I do not work against school; I work hand-in-hand with people who do school.) What is heartening is that after reading my book a parent knows the spectrum of possibilities. As for me, I think it is wonderful to be the son of parents who have made choices, but maybe our son will want to go to school. Choice and freedom are different things. One must not give only a choice, one must also give freedom. For example, if we offer a vegetarian the choice between pork and beef, there is a choice, but there is no freedom; there is no freedom to choose what matches his convictions. For my parents, not sending me to school was not an option but the only possible thing. They were both brilliant students – this is not about personal suffering; they had no score to settle with the school. They acted according to their convictions. Mon père, mon ami [My Dad, my friend] is the book (first published in German) I wrote with my father where we describe this continuity. He is the son of his father; I am the son of mine. I am delighted that my son was born into this family, in a great continuity, in the presence of my parents. I am very grateful to have met a woman such as Pauline, who shares the same convictions. She doesn’t adopt mine; it is not a mutual adaptation, but an encounter. Seeing Antonin evolving, seeing my son with my father, is a continuity that is a watermark in my life. Q: In your book you write about your parents providing the support, the environment, the tools, to find interesting people who are interested in your passions. What is their philosophy? Or is it rather a lifestyle? A: There is no philosophy, no method. Lifestyle would be closer, but it’s mostly and particularly an attitude. My parents saw us grow up, walk, talk, without educational intervention, without prompting, each one at his/her own pace. Now, they’re living a second wave with Antonin and approach his childhood with a tenfold confidence. Their main attitude is observation. In the observation position, one is protected from making mistakes. We no longer have time to think. Driven by curiosity, I observe what will be the next natural step in his development, rather than seeking how I could induce the next step. I rely on modern neurobiology: The child turns to his primary reference persons, who are his parents. The child expects from them approval, a green light. We have a huge responsibility: It is for us to give his spontaneity the support that he expects; we validate and then all other influences have no hold on him. The child has such a desire, such a need for approval, for reference, that he is ready to give up his spontaneity on behalf of whatever receives a good reception from his parents. We can allow the child to develop in his own way, or impose our own way: What a huge responsibility! We knew that, if we did not intervene, another step would come after 1, 3, 4, 6. We want to ensure that his evolution is his personal evolution, and not the result of our intervention. That’s what has always driven my parents. Another part of the attitude involves enthusiasm. Neurobiology tells us of exciting things. It was initially thought that we humans have different types of brains: fast, slow, stupid, smart. This was convenient and we created categories like under-talented, gifted, etc. Permanently. Some wise guy even had the idea (it was thankfully not pursued!) to sterilize people with an IQ level below a certain figure, to prevent them from reproducing. In fact, a brain develops depending on the use one makes of it. Scientists discovered that the brain area that controls the movement of the thumbs is three times more developed among fifteen-years-olds of today than of thirty years ago. Of course, that’s because of texting. As a result, they decided to treat the brain like a muscle, to make it really big. Since the area that deals with the thumbs has tripled in size, they invented a program to triple the volume of the brain. They tried to have kindergarten children learn five languages, but to their great disappointment, it didn’t work. The key discovery they then made is something we all have always known: The brain develops where it is used with enthusiasm! Now scientists realize that enthusiasm acts as a fertilizer for the brain. When we act with enthusiasm, the brain develops in a spectacular and automatic way. Neurobiology has taken years to prove what we all know by instinct and experience: Enthusiasm is the key. In a state of enthusiasm, learning happens “all by itself.” Do you know that small children experience a surge of enthusiasm about every three minutes? In adults, such a surge of enthusiasm arrives only two to three times a year! Children are born full of enthusiasm. Enthusiasm takes time. When, for example, I read an author or when I learned German for six hours in a row, nobody came after fifty minutes (the average length of a course in a classroom setting) to tell me that it was over. When we live our enthusiasm over time and with confidence, we deepen our knowledge and understanding, logically, every day. And I was able to experience that this has a spectacular side effect, which is competence. When we are enthusiastic, our competence increases at high speed. And competence has a side effect called achievement – success! Q: When you were very young, your dad gave you a guitar. In the book, you say that for your parents, music is vital, but that they don’t play any instruments. Do you see in this gift a calling, an implicit request? A: Not at all! This was part of what they offered me, like tools, trucks, cars, all sorts of things. The guitar was very important in flamenco music, which my father liked. But it was not a proposal; it was a gift. When you offer a truck to your child, it does not mean you want him to become a trucker. Q: So have you not experienced this omnipresent consumer mentality that is in our culture, where the parent wants to see that what he spent money on is actually being used by his child? A: When you live with your child, it is hard to go wrong on his enthusiasms; my parents noticed that my head was stuck on the floor when someone was playing the guitar on the floor below. If I offer planes to Antonin whenever I see one we like, it is because he loves airplanes, and motorcycles, and cars. And big trucks! I know he is passionate about those. But if I offer him a sewing kit, it’s not what interests him now. Every time we try to organize something, we risk imposing our ideas. The best thing to do is to let go, to not have expectations. This is what protected my parents, not to have expectations. When I was five or six years old, my dad took me to the planetarium, and we shared this enthusiasm – him, about things in the sky, and me, about the way things work in the planetarium. Neurobiology calls this “shared attention” – we are together without necessarily looking in the same direction. Q: How important was it to you as a child to explore by yourself, at your own pace? A: I have done things with vehemence, at my own pace, in my own way. Sometimes I took complex detours and, as a result, I have never forgotten what I learned. It was not always a straight line, but it was my path. That said, I did not invent the world or topics like string-instrument making or photography. But to have the incredible luck to be under the aegis of the best guitar maker in the world was beyond my craziest dreams! He said: “I can show you everything, but I cannot teach you anything.” It was wonderful! I did not learn just to pass an exam; what I learned has remained imprinted on me. My process was less direct, slower, more complicated, but it was mine and so far it has served me well. Q: In your book you write about visiting certain stores and people looking at you like you were an alien. Some unschoolers say they are looked at that same way sometimes. However, you also say that something in you was on the right track and you seemed pretty sure of yourself when you were a teenager. Did your parents help you with that? A: Actually, it wasn’t just when I was a teenager. I didn’t experience any teenage crisis. The crisis exists only in a certain frame; without the frame, it does not exist. That look of which I speak, I saw it in the shops, but not in normal life. Children are more open-minded than we think. For a child, who runs faster, jumps higher, is larger or smaller is not important when we do not impose comparison. I’ve always been a happy member of this society. I lived a life-sized socialization: When one is not confined with people of the same age and lives with many different people, one learns to do things with others, to combine experiences and competencies, rather than to compete. In the large social bath in which I was immersed, it was much more important to do things with each other rather than against each other. I’ve never felt different because I live in a world of difference. There was always someone to show me something, or someone to whom I could show something. That eliminated the gap between generations. It does not occur to an elderly person to compare herself to a child; she would rather share interests. What has led me to my friends is neither our age nor where we live; it is our communities of interest! Q: Your structured learning time began when you were twelve or thirteen years old – guitar lessons, and later, English, algebra, copperware, weaving, dance activities. Was that your request? A: That was always part of my life, with a stronger presence at that age. It was not a structure that I requested; it flowed naturally. There is no freedom without structure. For example, a personal rule may be to play the guitar six hours a day, a family structure may be to wash your hands before eating, or to eat together; a social structure is to drive on the right side of the street. We need structure. And if the algebra class was on Wednesday at 2pm, it was useless to go there on Sunday at 10am. It is a structure that a child understands very well and which reassures him and gives him a sense of freedom. Q: Your mom accompanied you to Egyptology lessons. For photography and copperware, she discreetly looked for a workshop, an open-minded professional who welcomed you without academic method. This discretion on the part of both of your parents seems to have been an important underlying element in this life without school. A: Discretion is important, yes, like when you have an uncle who is passionate about ties and you conspire to surprise him and everyone brings him a tie. It’s the same thing for the beer bottle caps collector. We remain attentive, if we see something interesting, we offer it to him. Freed from expectations, we can put ourselves in our child’s position. Q: I come back to music for a moment. People often wonder how to nurture their child’s musical talent. They wonder if unschooling provides enough discipline and rigor to prepare for a professional career in music. What do you think about this? A: I never start from me but always from the child. If parents listen to music, or if they play music, the child is steeped in music, but that does not mean he will play music. I would never try to win the child to one of my preferences. If it starts with him, then it’s not necessary to try to nurture his interest; it just happens, by enthusiasm. As for discipline, this question makes me laugh. Learning takes place because of the interest we have for things; self-discipline arises from the pleasure one has from doing these things. We believe, wrongly, that discipline is a framework imposed from the outside, that it requires a system that forces the child to do something to practice. However, the natural discipline comes from the child, from within. It grows out of pleasure and curiosity. For example, when I practiced the guitar six hours in a row, I was the one who imposed my discipline, my pace, onto my family. Another example: Antonin is listening to two minutes of Mozart’s The Magic Flute. At one point, we see him reacting to the sound of the little bells. He enjoys it and after he moves a little, he has less desire to be there; then, all of a sudden, he hears the sound of the bells again. So he knows that this sound he appreciates will come back and he is ready to sit still and to wait to hear it again. It is at this very moment that he is learning self-discipline: “If I sit for two minutes longer, I will have the pleasure of hearing the bells once again,” which leads him to want to stay four more minutes, then eight minutes. At his pace, at his own time, he chooses to listen for two more minutes. Now, he listens and watches The Magic Flute every day. This is an extreme discipline! At one-and-a-half years old, listening and watching The Magic Flute every day is a very high level of discipline – or just natural enthusiasm fully experienced. Q: Did you ever compare your life with those of other friends of your age? Q: Did any of your friends test you? A: No. I repeat: children are far more open than we think. What matters to a child is to play. And they take note of differences. They do not quantify, nor qualify them. Q: Your book is also a call to freedom, and to confidence. Do you think that parents are lacking confidence in their children? A: This is what characterizes most parents. They believe that if they do not educate their children, they will become illiterate and asocial savages. Yet children are extremely competent. Children are born with the best, the most suitable, and most amazing of learning devices ever invented: play. From then on, there is only room for confidence. 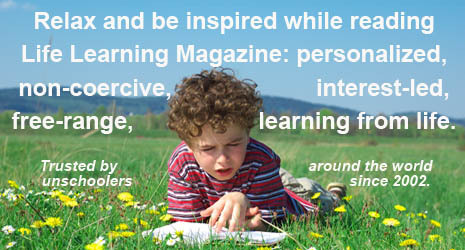 I am talking about extreme competence of the child, the learning capacity of the child. Enthusiasm leads to competence and then to success. There is nothing more to worry about. I sometimes talk to people who have no qualifications, no diploma, and I tell them that qualifications are not needed but competence is, and that this is the result of enthusiasm. Enthusiasm is free, available to everyone. I am a practical illustration of the weight of confidence. We must tell this story, so that parents see how much we have to trust children. Fascinated by learning and relationships, Edith Chabot-Laflamme has been involved in the homeschool movement, from the unschooling point of view, in Quebec, since 1999. Her life is filled with observations, research, chatting, writing, and translating, but first and foremost, living with her two sons (ages fourteen and twenty when this interview was published in 2012) and her husband. She is also editor of the Journal JOSE La Vie!.